A powder containing 4 billion viable Bifidobacterium bifidum a probiotic that is one of the predominant bacteria in the lower part of the small intestine. 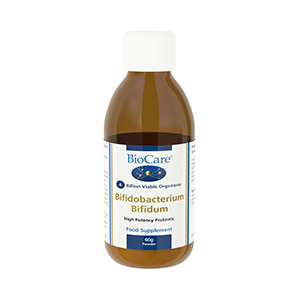 Provides a single strain of Bifidobacterium bifidum. Powder form easily added to food or drink for those unable or who prefer not to take capsule or tablets. If you are under medical supervision, please consult a doctor before use. This product should not be used as a substitute for a varied and balanced diet and healthy lifestyle. Do not exceed the stated recommended daily intake. Keep out of reach of children. Refrigerate below 4oC and avoid direct sunlight and heat.